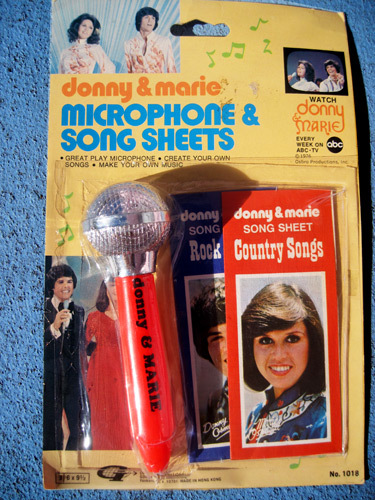 Donny Osmond may have won Dancing With The Stars and a whole lotta money for his favorite charity but a whole lotta money was the last thing that was spent on manufacturing this toy microphone and song sheets set at the height of the Donny & Marie Show frenzy in 1976. 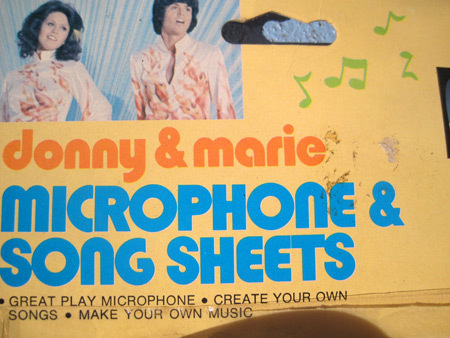 Despite the claim on the package that you too can “CREATE YOUR OWN SONGS • MAKE YOUE OWN MUSIC” the non-working plastic mic attaches to nothing and won’t get you much farther than singing into a candle or a shoe or anything else remotely microphone shaped. 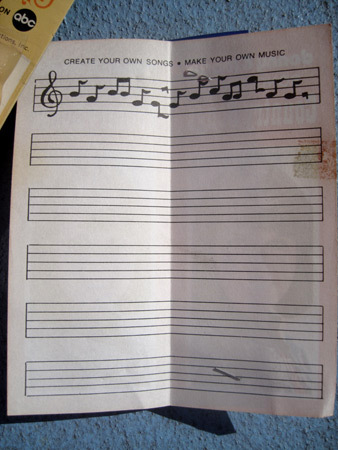 The “song sheets” are literally blank sheets of paper that you write the notes to your own song on should you have enough songwriting chops to pull one out of the blue and be blessed with the knowledge of how to notate music, the latter of which I don’t even know how to do. 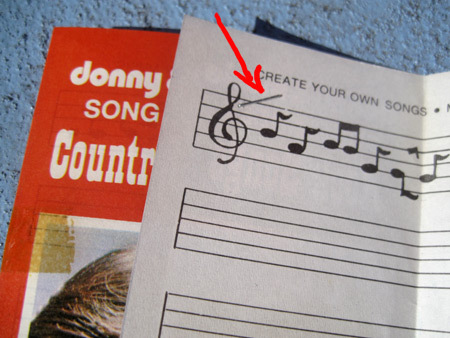 To make matters worse and even lower-rent, the song sheets are stapled together at the top and the bottom and it’s next to impossible without surgical instruments to remove the staples without ripping the one-ply-thick-thinner-than-toilet-paper paper it’s printed on. 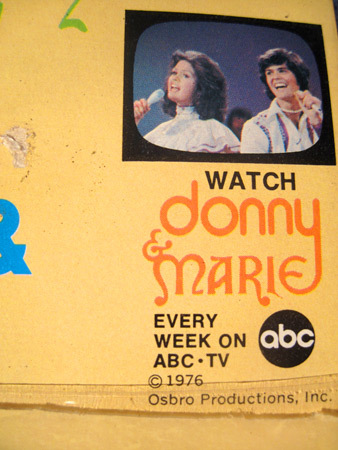 Made in Hong Kong during the heyday of the bro/sis acts’ ABC variety show by the family’s own Osbro Productions and distributed by Gordy International (how did Motown get into the act?) 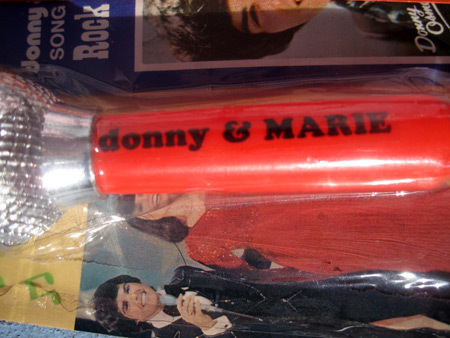 it also appears that Donnie got the shaft on the shaft of the microphone as Marie’s name got bumped up to all caps and Donny’s remains crushed into diminutive lower case letters. All around, this belongs in an express elevator up to the Penthouse of Kitsch because it is sooooo totally and completely cheaply made, meant to be dumped into bargain bins at all of the dollar discount stores that were just starting to get a smelly toehold on the American merchandising scene. 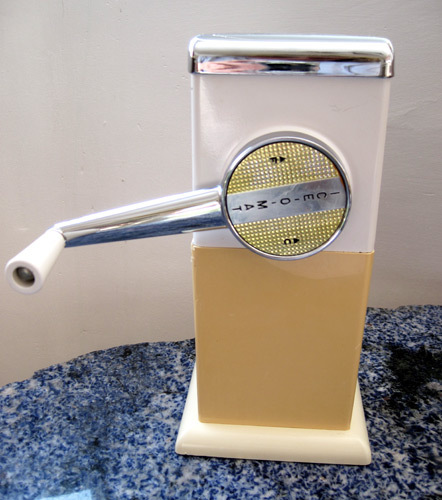 Long before it was de rigueur for refrigerators to come equipped with automatic ice makers a contraption like this hung in almost every kitchen in the world allowing homemakers to crush fine or coarse ice without lifting a hammer, the previous method of accomplishing such a thing. If you live in the US today is all about eating leftovers. These turkeys have been part of my post Thanksgiving overload ever since they were rescued from a thrift shop by my sister in Omaha, Nebraska in the mid 1980s. 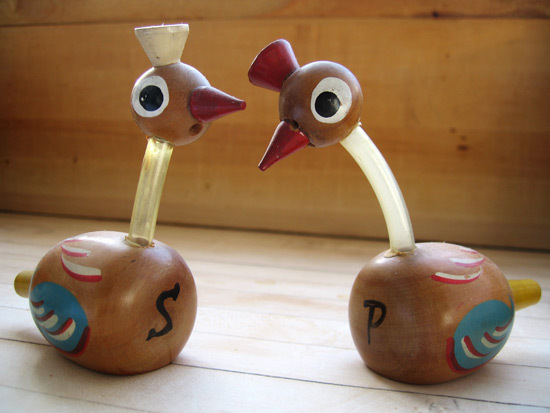 Made in the ’50s, these abstract fowl are filled by detaching the tail and shoving the seasoning inside, remaining faithful to the stuffing technique imposed on the real bird. I love Thanksgiving. The anticipation is so great I can smell the turkey and fixins wafting up my nostrils the entire month of November. 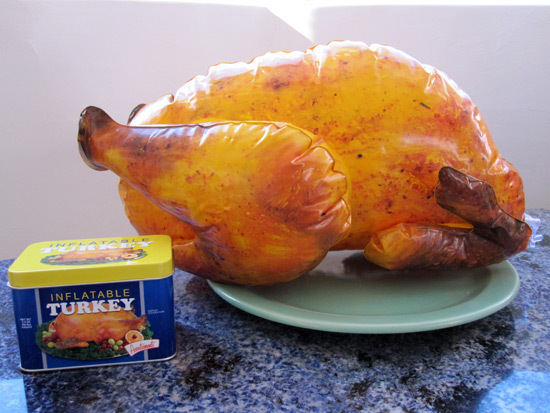 Every year I contemplate prepping the bird myself, eager to re-create my mother’s recipe using the best ginger ale in the land, Detroit’s own Vernors, but I thankfully receive enough invitations that one less fowl hits the ovens and my potential guests are spared from any possible food related illnesses. All this to say that when I found this inflatable turkey I was elated! It sits in the middle of my dining room table all month and then gets blown up again for Christmas. My house smells delicious because I have such a vivid imagination. Anyone’s welcome over to my place for some delicious plastic and hot air. Happy Thanksgiving! 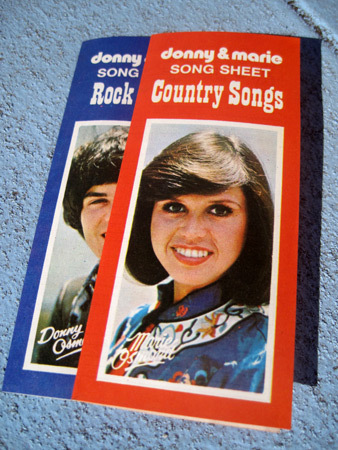 In my formative years of being a songwriter, the Captain and Tenille covered the AM radio landscape thicker than astroturf. Even their bulldog, Elizabeth, was part of the act that made wearing a dorky captain’s hat and walking around with a bowl haircut that looked like it had marshmallows stuffed in the curled under ends fashionable. 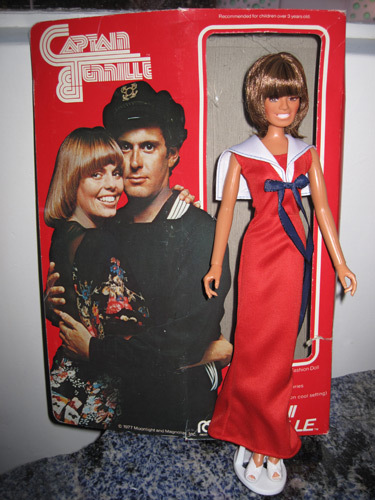 But for whatever can be said about their ultra bubblegum, cringingly cute look, Captain and Tenille made equally as cute yet great Pop records like “Love Will Keep Us Together”, 1975 Record Of The Year, and the evermore schmaltzy “Muscrat Love”, a song with a great melody whose arrangement featured scrunched-up-rat’s-nose synthesized rodent sounds. 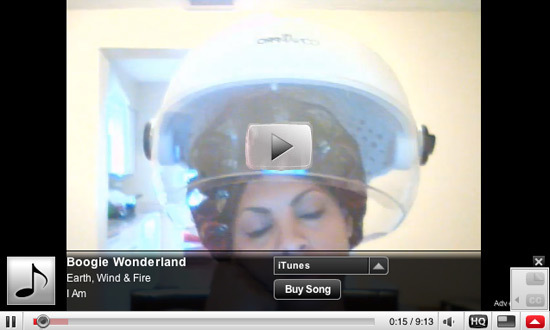 Allee Willis’ Kitsch O’ The Day – Whipped Cream Spa in Desert Hot Springs CA. 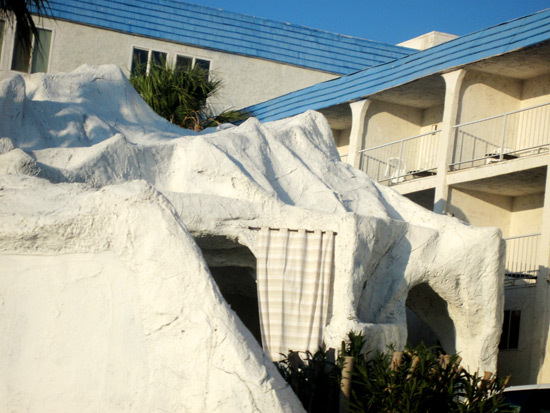 Rising like several healthy squirts of whipped cream on an otherwise dull sundae, the Sanctuary spa/resort/fantasy masterpiece of plaster workmanship on Palm Dr. in Desert Hot Springs, California almost caused me to have a car wreck when I first drove past it. Absolutely incongruous with anything else in the area, it still gets my vote as hot spot in town. 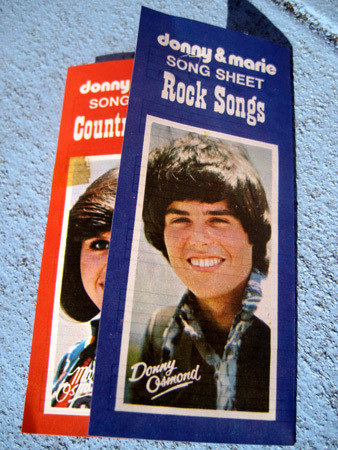 As most of you know by now, I’m one of the few songwriters who loves when their songs are used or performed inappropriately as it turns the songs into masterpieces of Kitsch. 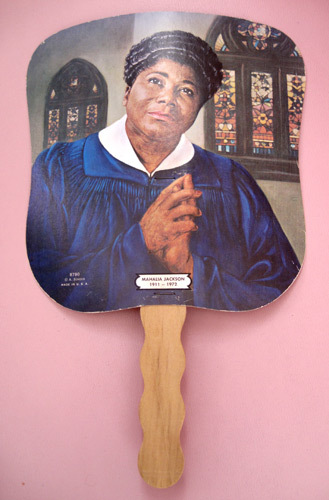 I never set out to write Kitsch as I love music too much but if I leave it in the hands of all the people who love to see themselves on YouTube I’m rarely disappointed. 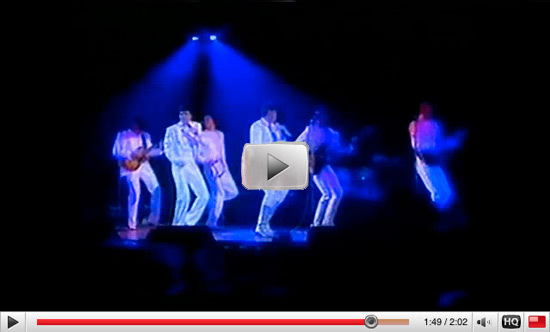 As opposed to a performance, this is someone who’s chosen to verrrry sloooowwwwly show us how to achieve a Dominican hairdo using two Earth Wind & Fire songs as background music, “After The Love Is Gone” and “Boogie Wonderland”, the latter of which I co-wrote and the significance of neither in regards to the the subject matter make any sense.